To purchase the land records associated with this site, simply contact my office at (361) 595-8548 and provide the volume(s) and page(s) for processing. Copy Fee is $1.00 a page with an additional $5.00 for certification if needed. Effective September 1, 2015 Senate Bill 200 article 5 requires a notarized proof of identity when applying for a birth or death certificate by mail or email. Properly qualified applicant must present an Acceptable form of ID to obtain a Birth Certificate / Death Certificate. An applicant can be either the registrant, his or her parents, guardian, or the children, spouses, siblings, or grandparents of the registrant. If requesting documents through mail, you will need to send the application for Birth/Death record, photo copy of our ID,notarized proof of identity form and payment. Requirements for marriage ceremony conductors: Texas Family Code. 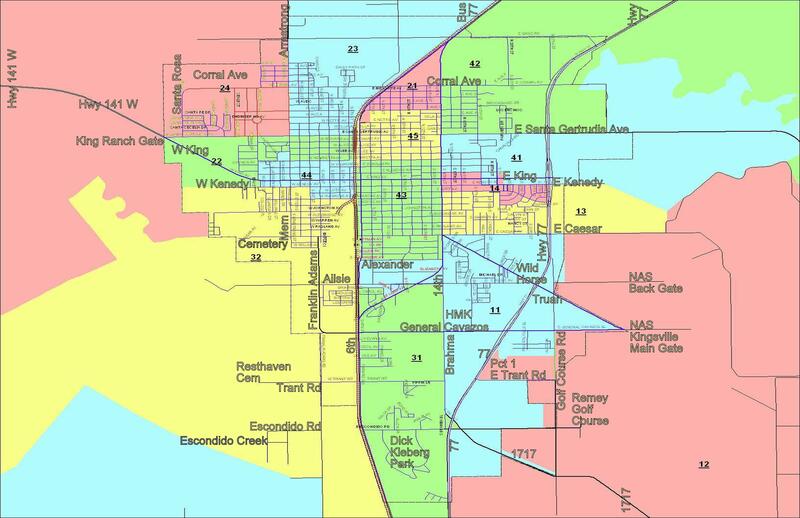 In the maps below, the first number in your election precinct signifies your commissioner precinct. Example: Election precinct 11 is commissioner precinct 1; Election precinct 21 is commissioner precinct 2 and so on. SALES ARE CONDUCTED ON THE FIRST TUESDAY OF EACH MONTH AT THE WESTSIDE STEPS OF THE COURTHOUSE. Self help information can be found at www.TexasCourtHelp.gov. This website provides links to specific information e.g., lawyer referral services and legal aid offices. State Law Library Website: www.sll.texas.gov. Thirteenth Court of Appeals serving Kleberg County. Commissioners' Court Hearings are held at the Law Enforcement Center, Courthouse Annex at 1500 E. King, Kingsville, TX at 9:30 a.m. on the second Monday of each month and at 1:30 p.m. on the fourth Monday of each month. Agendas for each meeting may be found on the Quicklinks tab under Public Notices. Any Deed conveying an interest in real property, executed after December 31, 1981, shall contain a mailing address of each GRANTEE appearing in the document (or separate instrument signed by Grantor or Grantee and attached to the document). If the address is missing, said document(s) WILL be rejected. 1. Document must have original signatures. 5. Margins must be 1” at top of each page. 9. Font size cannot be smaller than eight point type. NOTICE: Texas requires that brands be re-registered in the county every ten years. Click on the link below for more information.